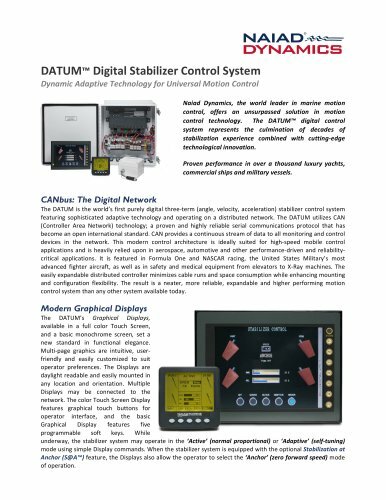 DATUM™ Digital Stabilizer Control System Dynamic Adaptive Technology for Universal Motion Control Naiad Dynamics, the world leader in marine motion control, offers an unsurpassed solution in motion control technology. The DATUM™ digital control system represents the culmination of decades of stabilization experience combined with cutting‐edge technological innovation. Proven performance in over a thousand luxury yachts, commercial ships and military vessels. CANbus: The Digital Network The DATUM is the world’s first purely digital three‐term (angle, velocity, acceleration) stabilizer control system featuring sophisticated adaptive technology and operating on a distributed network. The DATUM utilizes CAN (Controller Area Network) technology; a proven and highly reliable serial communications protocol that has become an open international standard. CAN provides a continuous stream of data to all monitoring and control devices in the network. This modern control architecture is ideally suited for high‐speed mobile control applications and is heavily relied upon in aerospace, automotive and other performance‐driven and reliability‐ critical applications. It is featured in Formula One and NASCAR racing, the United States Military’s most advanced fighter aircraft, as well as in safety and medical equipment from elevators to X‐Ray machines. The easily expandable distributed controller minimizes cable runs and space consumption while enhancing mounting and configuration flexibility. The result is a neater, more reliable, expandable and higher performing motion control system than any other system available today. Modern Graphical Displays The DATUM’s Graphical Displays, available in a full color Touch Screen, and a basic monochrome screen, set a new standard in functional elegance. Multi‐page graphics are intuitive, user‐ friendly and easily customized to suit operator preferences. The Displays are daylight readable and easily mounted in any location and orientation. Multiple Displays may be connected to the network. The color Touch Screen Display features graphical touch buttons for operator interface, and the basic Graphical Display features five programmable soft keys. While underway, the stabilizer system may operate in the ‘Active’ (normal proportional) or ‘Adaptive’ (self‐tuning) mode using simple Display commands. When the stabilizer system is equipped with the optional Stabilization at Anchor (S@A™) feature, the Displays also allow the operator to select the ‘Anchor’ (zero forward speed) mode of operation.